Everything is slowly waking up after the wet winter and the lawns here at EVRG are no exception! Mowing and brush cutting the edges will be a weekly chore along with the continual weeding that must be on going to keep up with the ‘ best of the best’ well known gardens. The new growth on the Acer capillipes (Snake bark maple), are quite striking and has received a lot of attention during the week, especially when we had a walking group through for the day. It is native to mountainous areas of Japan. 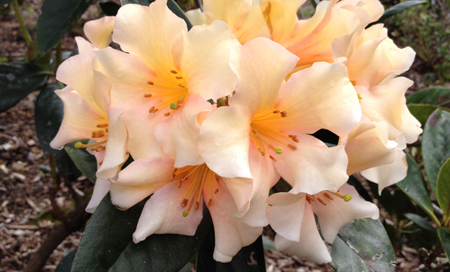 The rhododendrons are beginning to flower and are looking fantastic, even some of the big leaf varieties are still in colour so if you have missed them, then come and see them quick! Flowering at the moment in the garden and up at the nursery are R. irroratum ‘Polka Dot’, R. lutescens, R. liliiflorum, R. dendrocharis, R. boothii mishmiense, R. ‘Bibiani’, R. ‘PJM’, R.‘Freckle Pink’ and of course this is only naming a small handful! To read more of this article see the newsletter.